The Sun River Wildlife Management Area (WMA) is a 20,000 acre wildlife refuge managed by the Montana Fish, Wildlife and Parks, and is located just to the west of Augusta, Montana. Like other wildlife management areas in Montana, the primary purpose of the Sun River WMA is the protection of crucial habitat for wildlife. In particular, the Sun River WMA provides critical winter range for elk as the refuge sits right along the eastern edge of the Rocky Mountain Front. 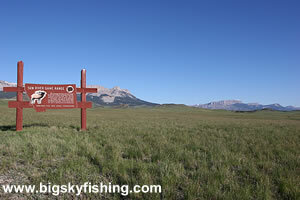 Despite being relatively easy to reach, few people visit the Sun River WMA except during hunting season. And during the summer months, swarms of people unknowingly pass near this beautiful refuge on one of the several popular highways that pass through Choteau and Augusta. Although hunters primarily use the Sun River Wildlife Management Area, there is far more to do inside the refuge than just run around and shoot things. The refuge provides superb horseback riding across a vast open plain in the shadow of the towering peaks of the Rocky Mountain Front. Many unofficial hiking trails are located in the refuge, and provide for excellent hiking well-away from the crowds. 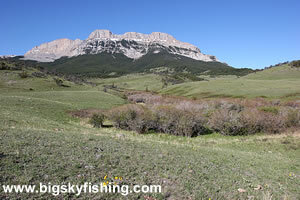 And for the purposes of this section on Big Sky Fishing.Com, the Sun River WMA provides a short, easy yet very beautiful drive through some of the prettiest terrain found along the Rocky Mountain Front. Reaching the Sun River WMA is simple. From Augusta, just follow the Sun River Road/Gibson Reservoir Road for about 3 miles. At the fork in the road, go left. After a few more miles, the road reaches the eastern boundary of the Wildlife Management Area. Although the drive to the border of WMA is scenic, the drive becomes very beautiful once in the WMA. The road gains elevation once in the WMA and travels across a vast grassland that offers superb views of the Rocky Mountain Front. And as the road gains elevation, visitors have fine views of the prairie that spreads to the eastern horizon, too. As the road nears the base of the Rocky Mountain Front, the grassland gives way to a mix of grass and forest. Visitors can continue to follow the road until it ends, near the Sun River Road. Along the way, visitors will have superb views of jagged mountain peaks, have the opportunity to see a wide variety of wildlife, and pass by a small, scenic lake. The Sun River WMA Byway follows gravel roads for its entire length. The road is in excellent condition until it reaches the WMA. Once in the WMA, the road becomes a bit narrower and, the further one goes down the road, the rougher and narrower the road becomes. However, passenger cars will have no problems driving to the most scenic parts of the refuge during normal weather conditions. The Sun River WMA isn’t open year-round. It’s normally open from mid-May through mid-November. Although I’m not 100% positive, I suspect the refuge is closed during the winter and spring to protect the large herds of elk that congregate here. Overall, anyone passing through Augusta or heading down the Sun River Road toward Gibson Dam or Willow Creek Reservoir should consider taking this short but exceptionally scenic detour. The map below shows the route and location of the Sun River Wildlife Management Area Byway and other nearby scenic drives. The Sun River WMA Byway is located outside of Augusta, Montana. Bring your tent, camper or RV, as there are no services of any kind located along the drive or in the Sun River Wildlife Management Area. Developed campgrounds can be found at nearby Willow Creek Reservoir and Nilan Reservoir. Primitive camping is also allowed in the Sun River WMA. For those wanting in-town life, there 'might' be a small motel in Augusta. There are also a few small hotels in nearby Choteau, too.